Our bunker renovations of #17 required some additional bentgrass to replace some of the collar that was removed during the construction. Both our collar and greens nursery have soil structure issues that can grow bentgrass adequately but when transferred to an green on the course, it normally fails. Over the last couple of years, we have begun the process to remove the false bent grass fronts on the greens. An explanation of my reasoning regarding this removal is listed below. 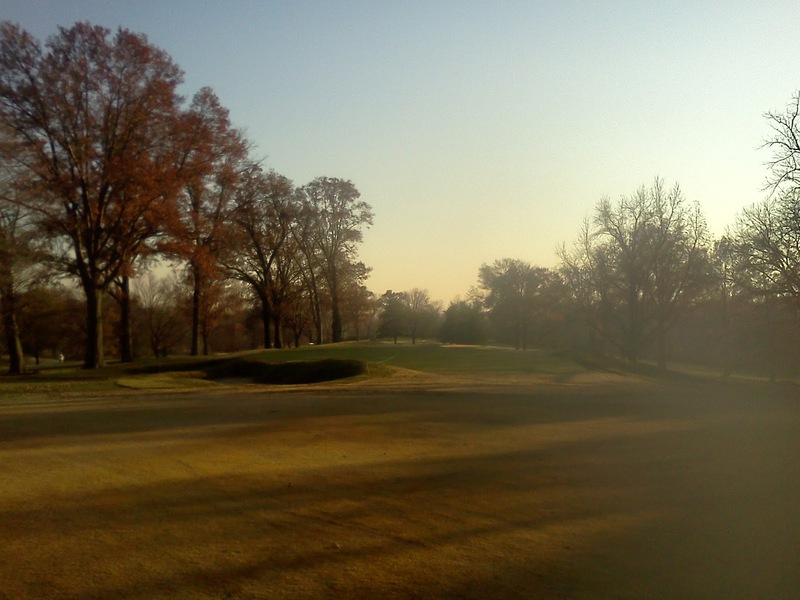 Provide a consistent playing surface of Zoysia on the fairway, approach until reaching the collar/green. 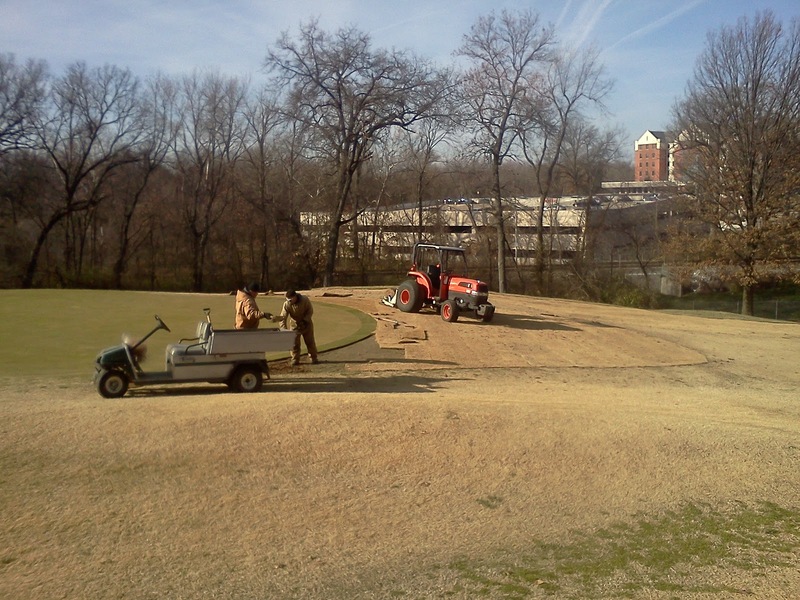 Bentgrass requires many more inputs of water, fertilizer, fungicide and insecticides. Also, it must be walk mowed which requires additional labor. It also must be hand watered during the summer to reduce stress. 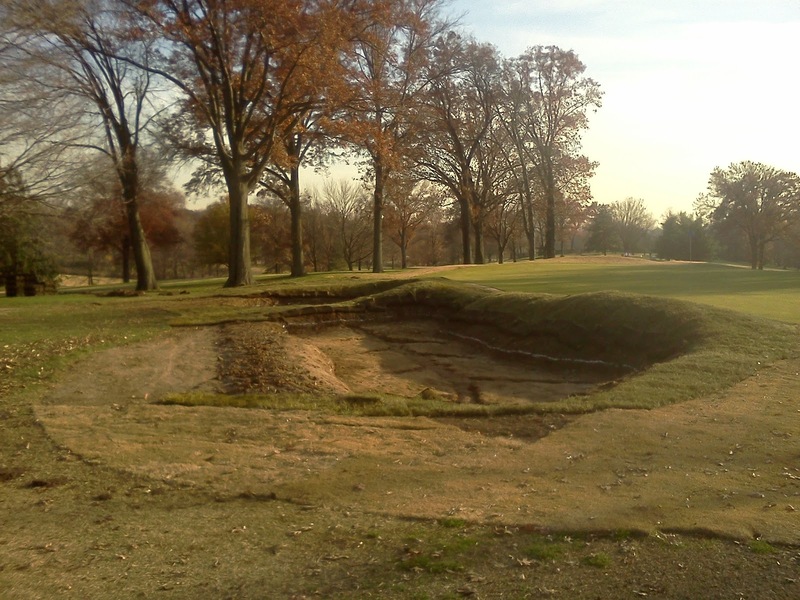 USGA agronomists in site visits to the course since I have been at Glen Echo has recommended that the bentgrass approaches be removed for the reasons listed above as well. Other clubs in the area have removed or have been in the process of removing the false fronts. My staff has informed me that the false fronts have been drastically reduced in size over the last 10 years or so. 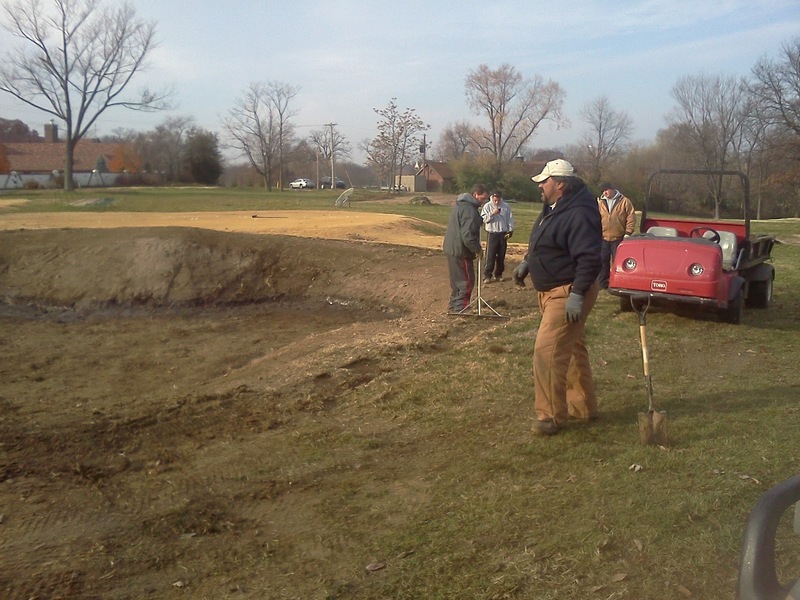 The green committee evaluated a recommendation made by Kye Goalby before the bunker project that included the removal of a few trees near #2 green and providing an expanded approach/fairway and green side fairway area. 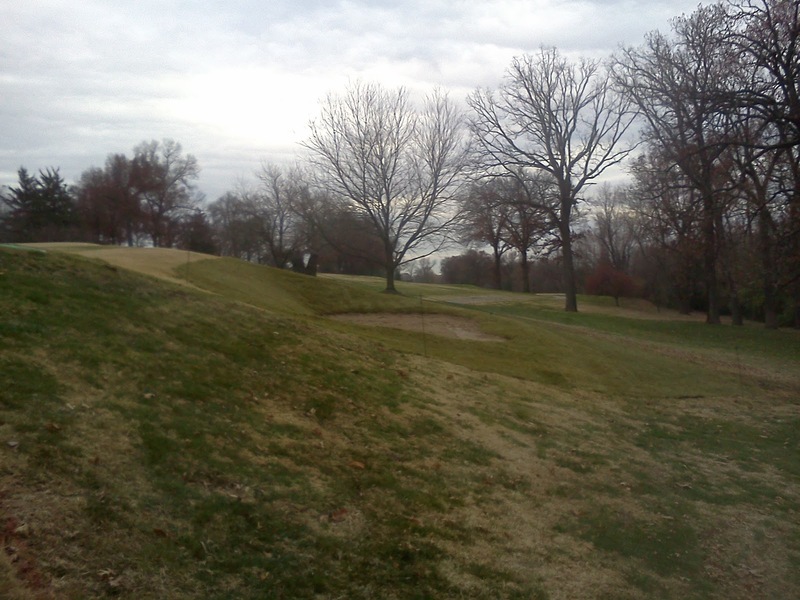 The committee agreed with the recommendation and during our bunker tree removal, we removed the trees on #2. To insure we had adequate money for the bunker project, we delayed the work until after the project was completed. 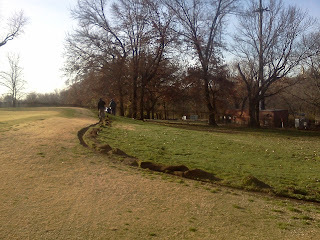 The committee gave us the go ahead on Tuesday and we began stripping away the sod. A majority of the sod was laid on Thursday and we will finish this area today. 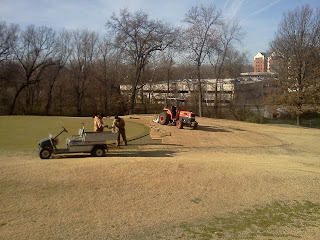 Sod being removed from the front of #1. 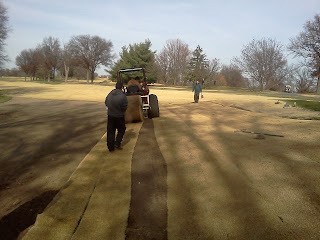 Zoysia being laid on the approach. Sod being stripped away from the right of #2. 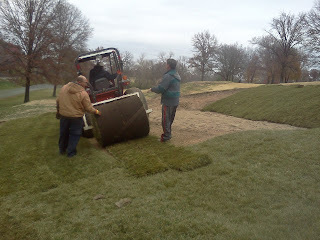 Big roll sod being laid on #2. Near complete. 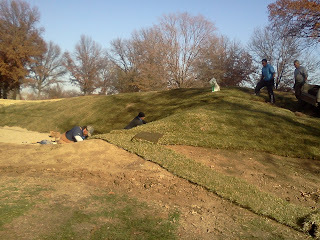 We have about 2 rolls of sod to finish the job and some additional cool season turf along the edge of the area. With beautiful weather scheduled the next few days, I making an offer you can't refuse. Carts will be allowed off the paths for Friday November 30th, Saturday December 1st, and Sunday December 2nd. Come one, come all, bring a guest or two and enjoy some food and drinks in the clubhouse afterward as well as some college championship games!!. One day special offer on Black Friday!!! for the Turkey Day Scramble so come out, buzz around the course and enjoy a beverage or two after the round in McGrew's Pub! Happy Thanksgiving. Thanks for all you do for us!! Day 39 Bunker Restoration, ALL BUNKERS ARE FINISHED, TERMINADO, TERMINEE, FINITO!!! The staff finished the practice bunker on Tuesday which is the last bunker in our overall project. 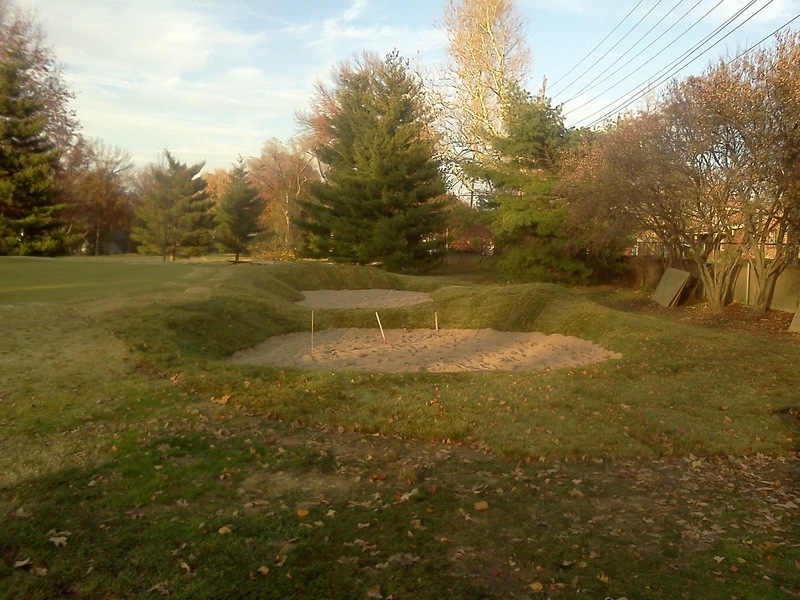 We had 45 bunkers when we started last season and now have 37 bunkers to maintain. The project has come in at or near our budget. There were a few surprises along the way but most everything went as planned. The staff faced some pretty difficult circumstances with the rain we experienced in the first half of the project but some dry weather over the last half allowed us to get the project completed fairly close to schedule. Cleaning up out flow trenches and sodding as needed. 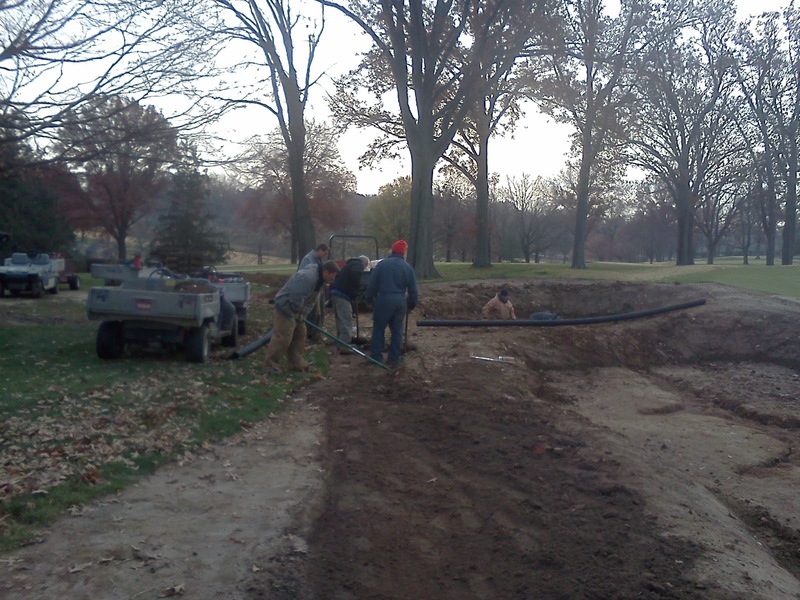 Hand watering the new sod to push root growth before winter sets in. 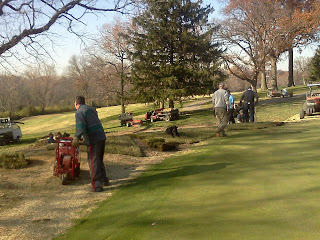 Trimming sod edges along the bunker edge. 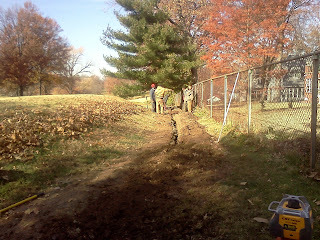 Back filling settled trenches and seeding areas next to construction which were disrupted but did not require new sod. We will also be expanding the targets that Kye shaped before he left the project and will be seeding them with rye grass and covering them with straw. We intend to sprig the targets with bermuda grass in mid-spring so that they can be mowed tightly giving them a green surface appearance. Staff edging the practice bunker. 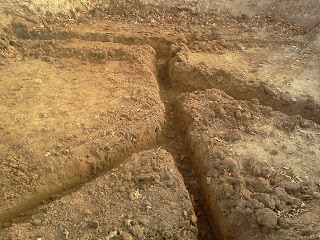 Forming an edge which will allow the new sod to tie into the existing area. Removing the old sod along the new edge. Sodding the new practice bunker. 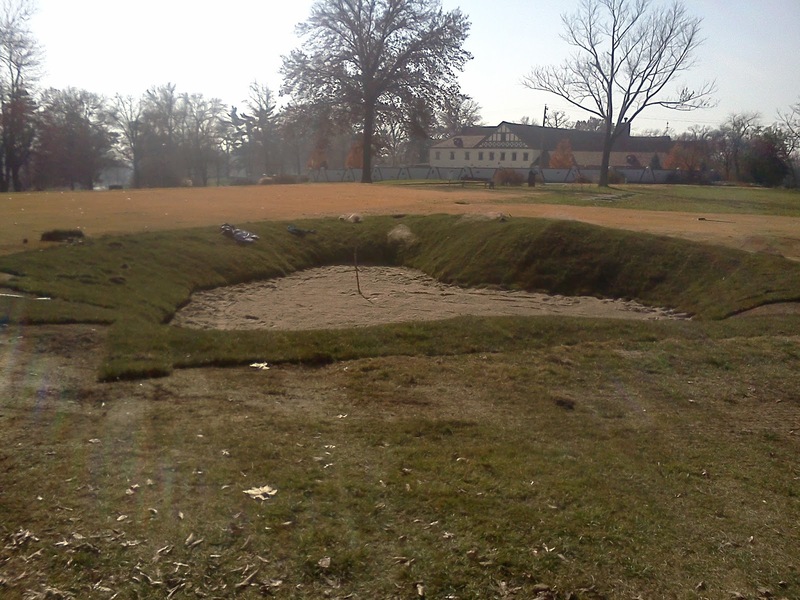 Day 38 Bunker Restoration, THE GOLF COURSE BUNKERS ARE FINISHED!!! 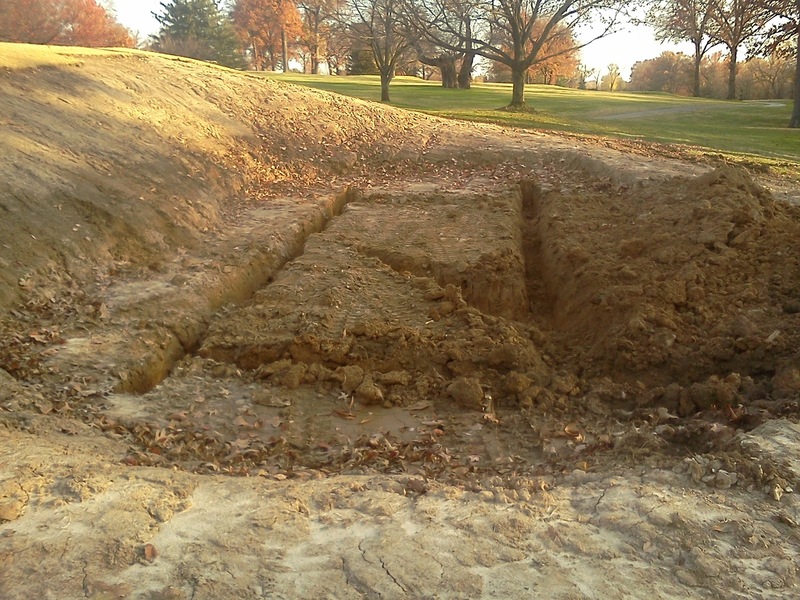 With great anticipation and excitement, our bunker project began on September 17th. At the end of the day today, I am relieved and very happy to announce that we have completed the bunkers on the golf course!! The remaining sod was placed around #17. 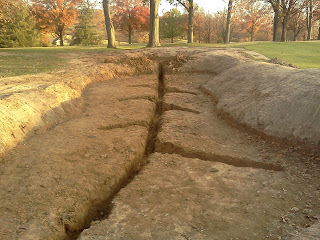 The soil was removed from the trenches of #1 and drainage was installed. Sand was hauled into the bunker and sod was placed around it. 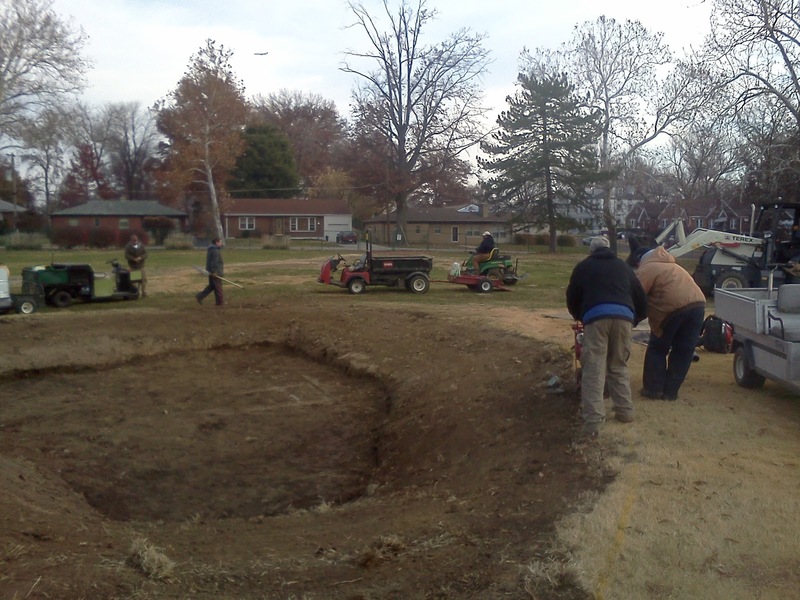 We plan to complete the practice bunker on Tuesday. At this time, the following bunkers have been opened for play. Bunkers that are open for play have no ropes around them. 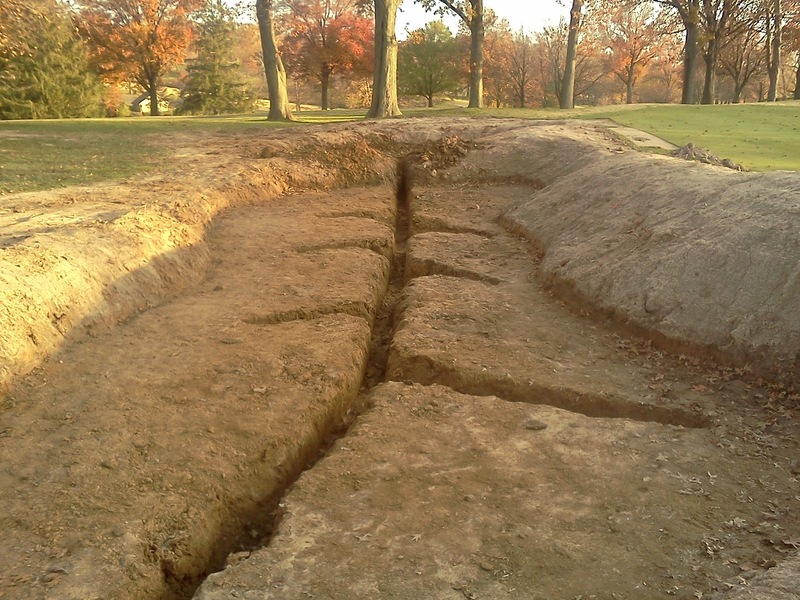 As the sod continues to mature, we will open additional bunkers to play. #5 left approach bunker All of #9 All of #18. 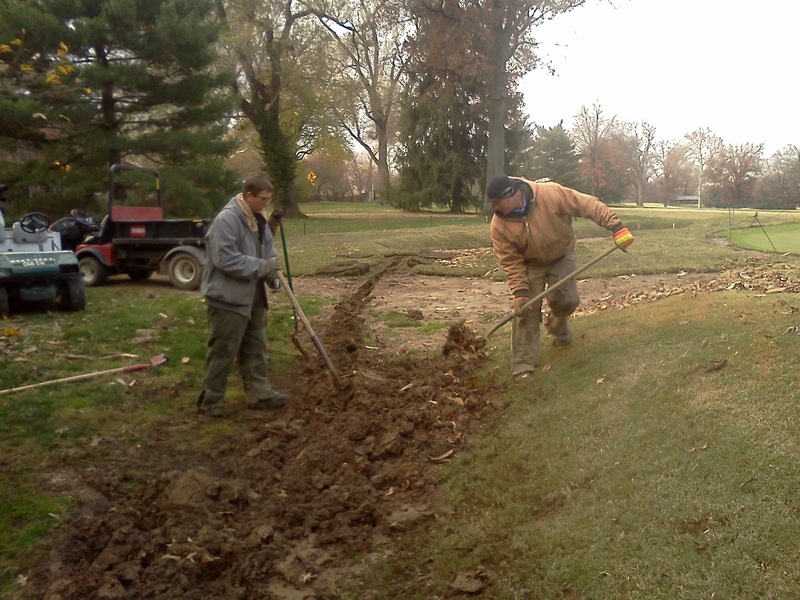 The staff removing the soil from the trenches on #1. 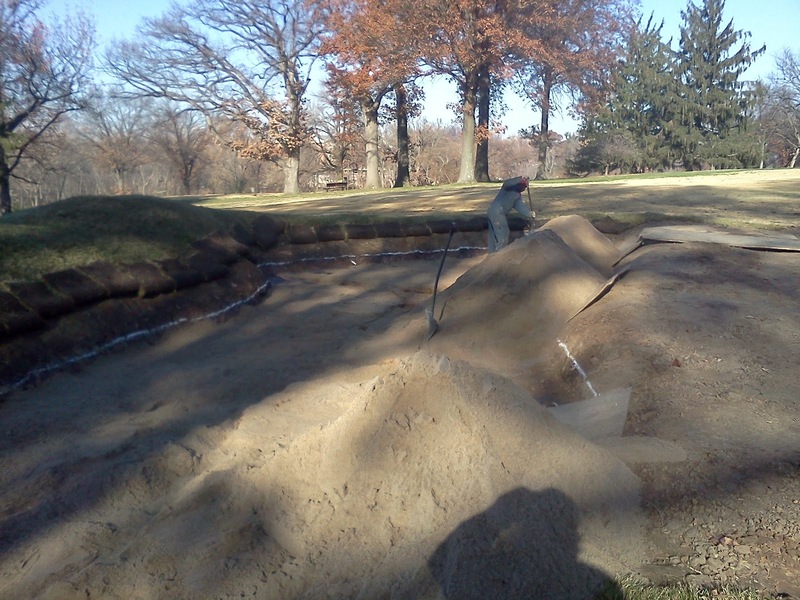 Sand being added to the bunker. 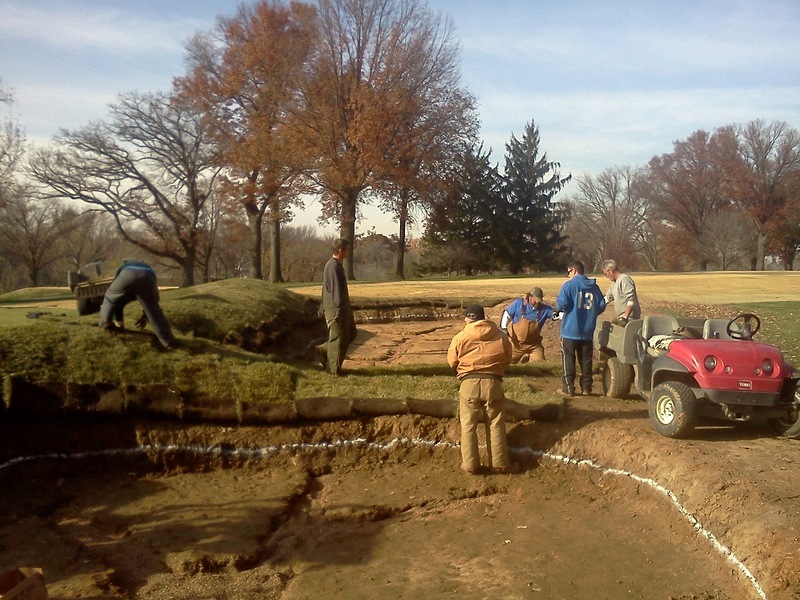 Sod being laid around the bunker. 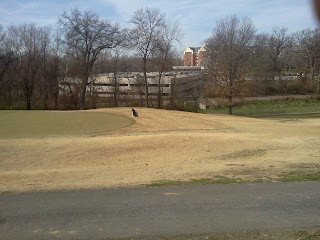 A view from along the fairway of #1. The last bunker on the course is being completed hopefully by the end of today if the rain stays away. 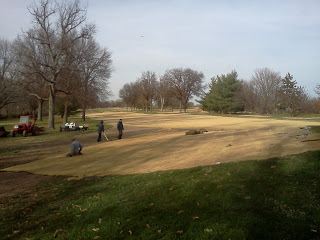 We still have the practice to finish and some cleanup on various holes. The staff was able to get the three bunkers on #17 nearly completed on Friday. We still have the outflow trenches to back fill and packed and we have some sodding to do on the right bunker. 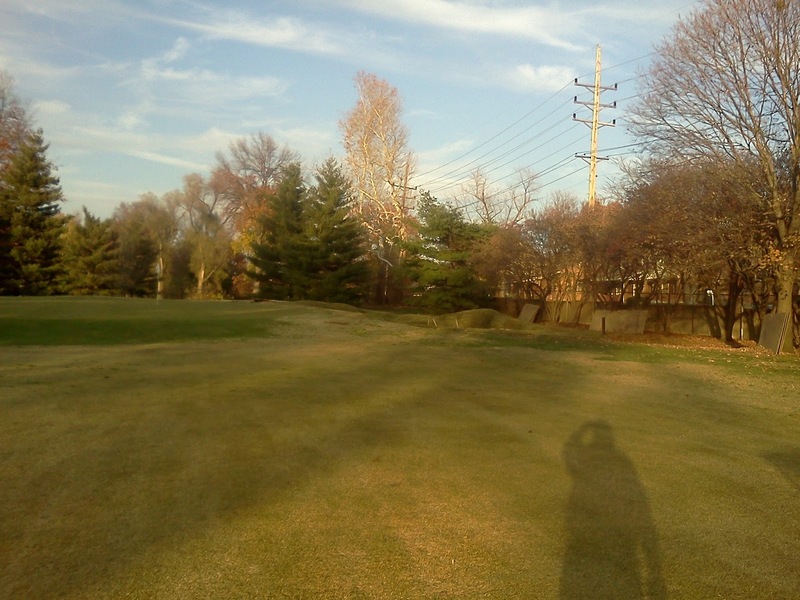 We also have some bentgrass collar that needs to be replaced. We will be cleaning out #1 bunker on Monday, install drainage, sand and sod which will complete the golf course portion of the project. We still have work to do on practice range and will take care of that as soon as possible. 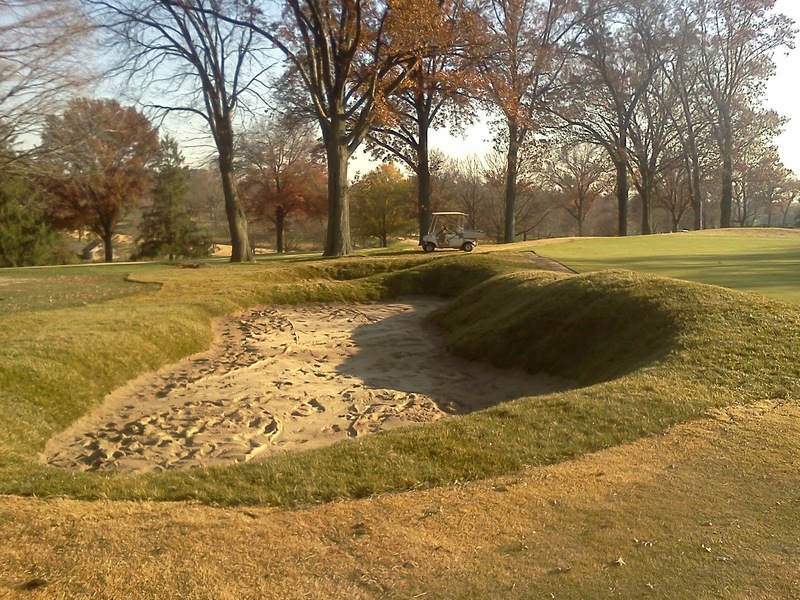 We will be spending the next couple of weeks checking and cleaning up our work areas, back back fill settled trenches, trimming sod, watering, mowing and other work to get the bunkers and course ready for winter. 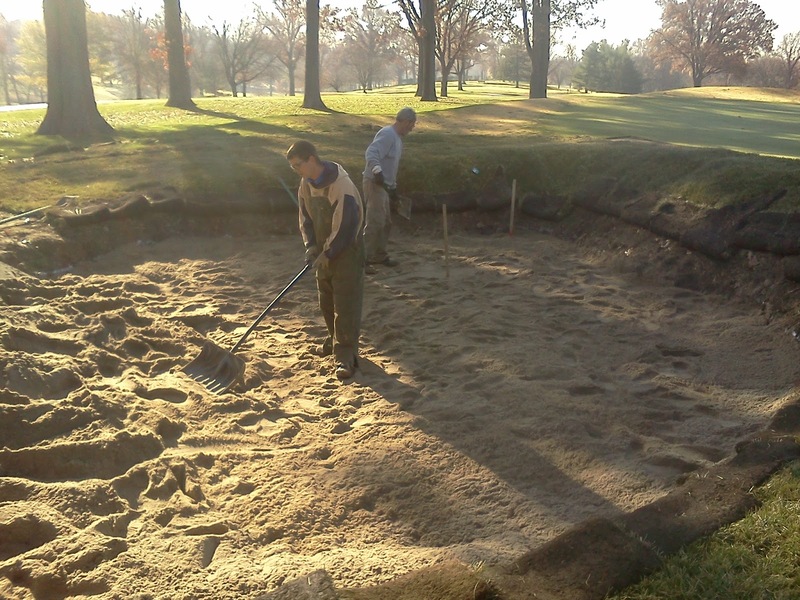 Randy moving sand in the left front bunker of #17. 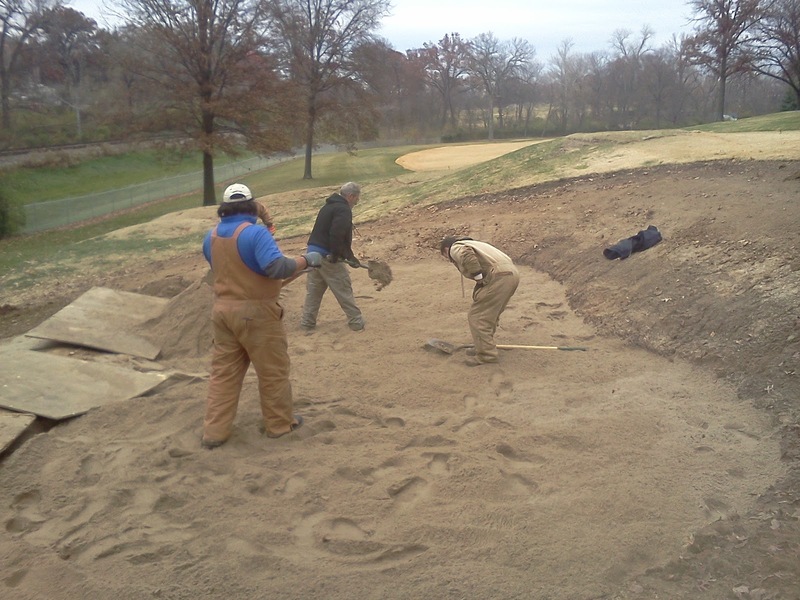 Staff spreading sand in the left rear #17 bunker. Finishing the sand in the left bunker of #17. 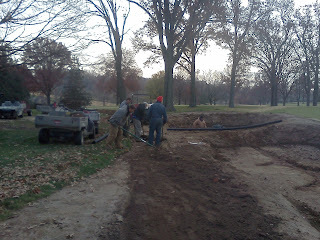 Placing drainage in the right side bunker of #17. Sodding the right side bunker of #17. 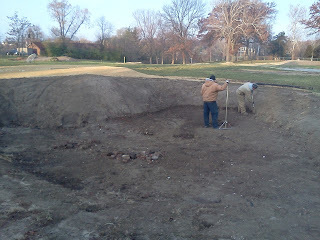 Right side bunker #17 nearly complete. 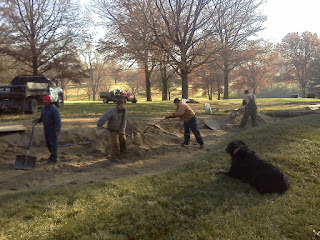 Some sod work around the green and the front edge of the bunker and outflow trench back fill. The left bunkers on #17 complete except for some drain outflow work and collar sodding next to the green. 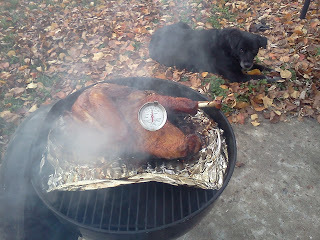 Lady showed up today making sure the guys get #17 fnished as planned. Staff spreading sand this morning. Another frosty morning greeted the staff which delayed our work on the bunker project for an hour or so this morning but the staff had a busy day on #17 bunkers once the frost lifted. 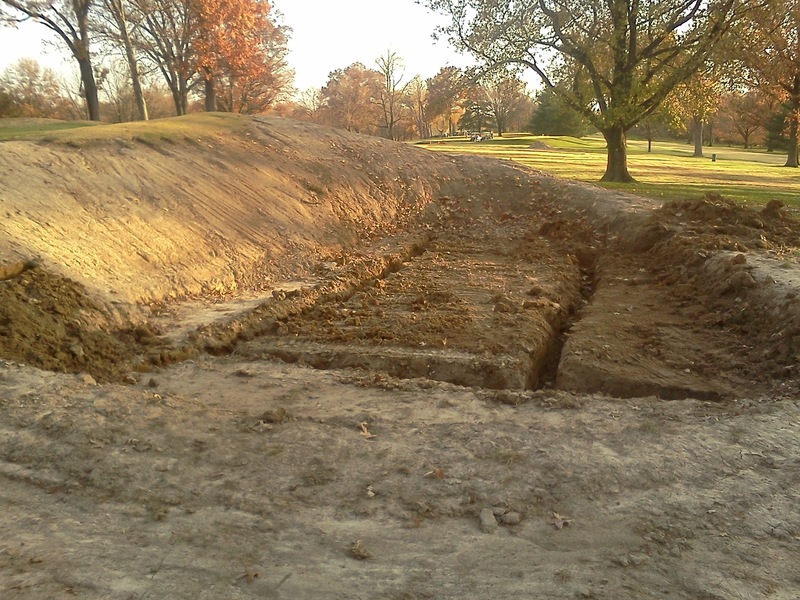 The left bunker was cleaned up and drainage installed. 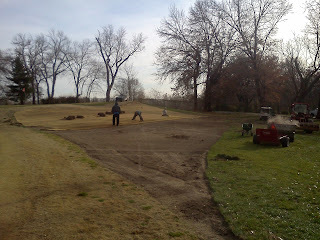 Sodding was completed around the left side bunkers and we expect to get the sand spread on Friday. We still need to clean up the right bunker on #17, install drainage and plan to complete it on Friday as well. 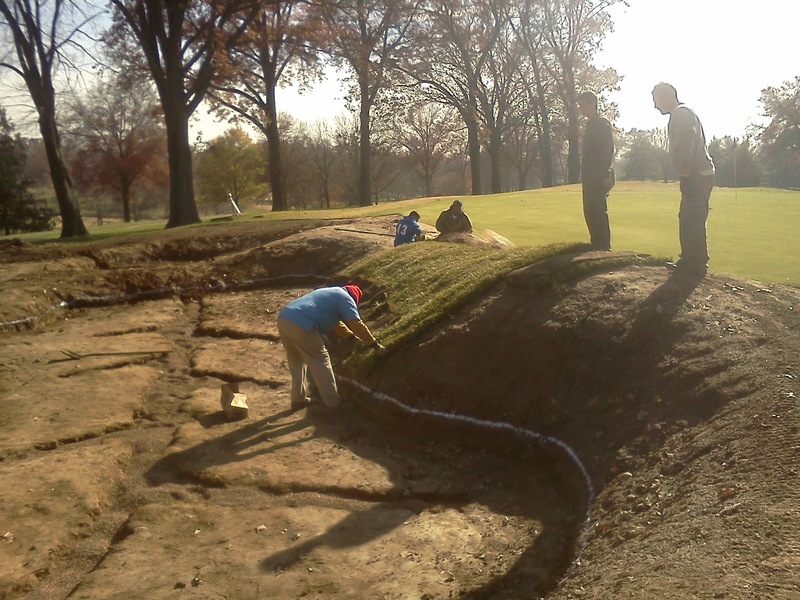 Hopefully, all three bunkers will be completed on #17 by the end of the day tomorrow. 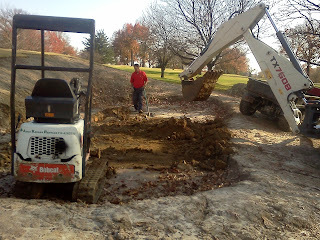 This will leave us with one bunker on #1 and the practice bunker. 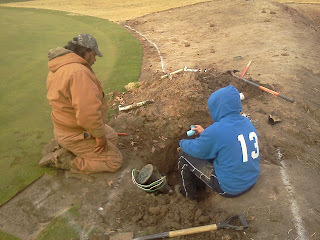 Skip and Tom extending the front left sprinkler heads on #17. 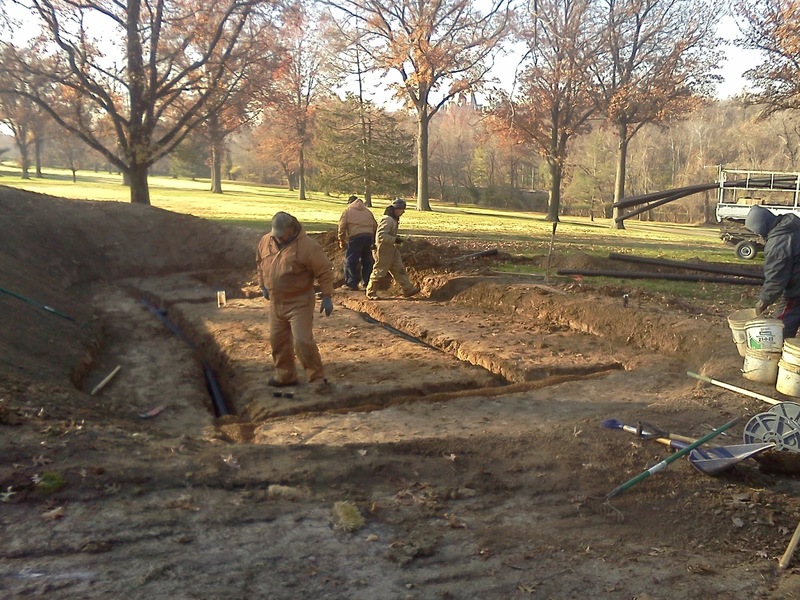 Drainage install on the left rear bunker of #17. The staff cleaning up soil along the edge of bunkers of #17. Sodding of the bunkers on #17. 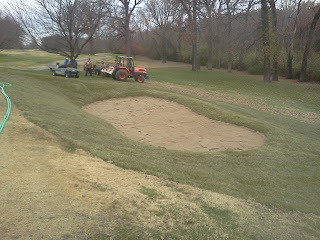 Additional sodding of left side bunkers of #17. 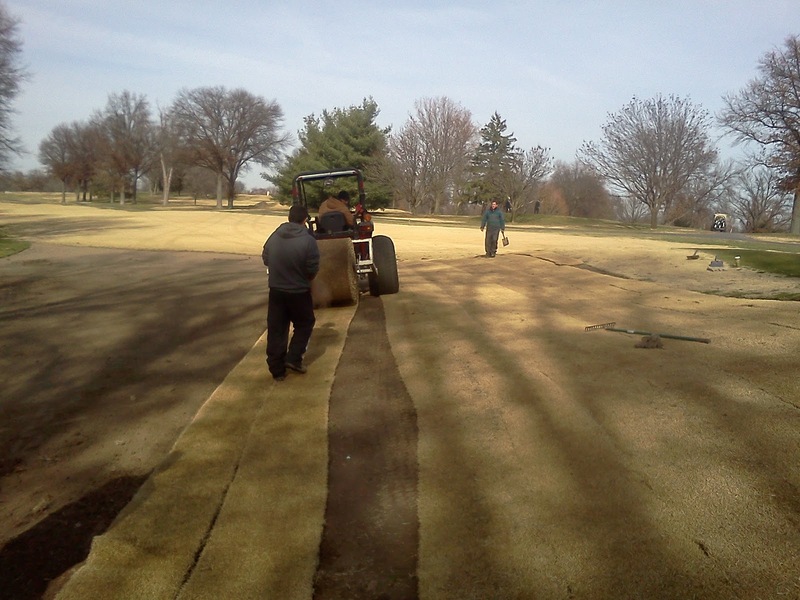 End of the day sodding for #17. 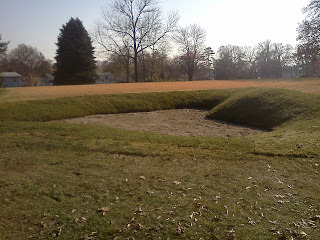 The fairway side of the bunkers will be sodded once the sand is dumped into the bunkers. We received well over 1" of rain Sunday evening which was needed. 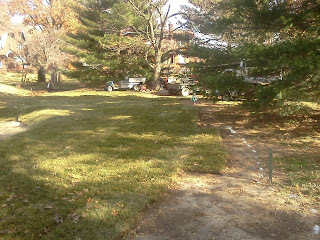 Some of our sod was getting pretty dry from the winds of the last few days. 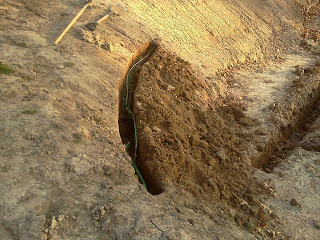 We were able to do some outflow trenching to finish the right bunker of #5, #17 bunkers had the outflow trenched as was #1. 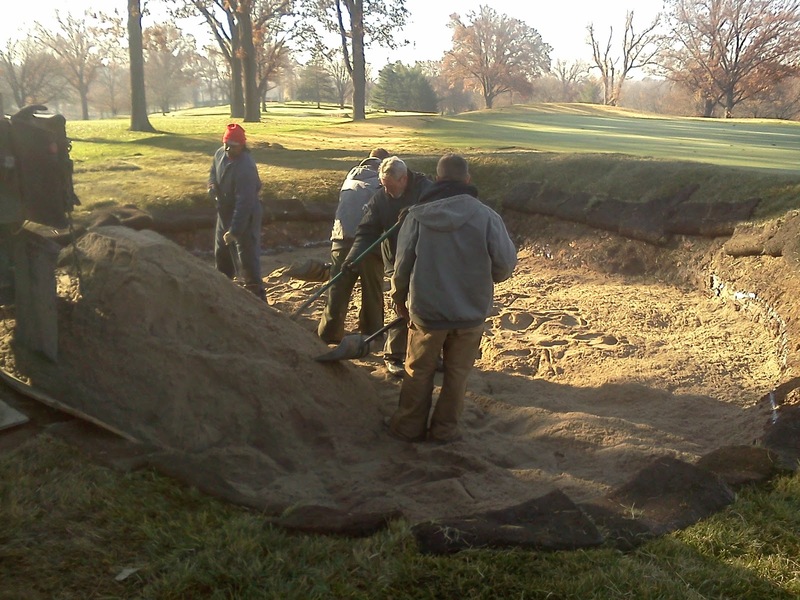 Today, the staff will put in a full day on the bunker project. 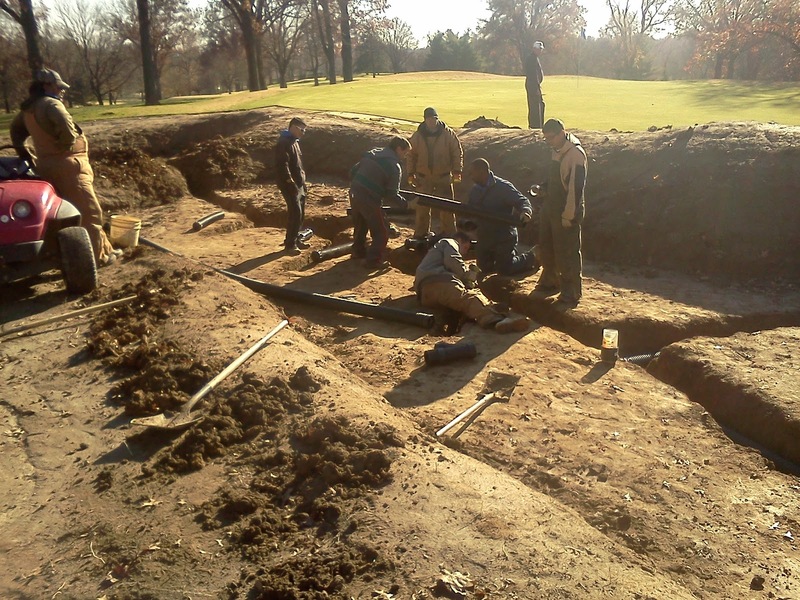 The outflow pipe was laid and back filled on the right bunker of #5, sod work was finished around the back right of the right side #5 bunker, and some sod was added to the left bunker of #6. Drainage was placed in the front bunker of #17. We plan to spread the sand in the front bunker on Thursday and hopefully get it sodded. I would expect that we will complete the left side bunker of #17 on Friday. 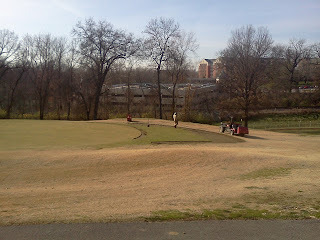 Sodding the back right of #5. 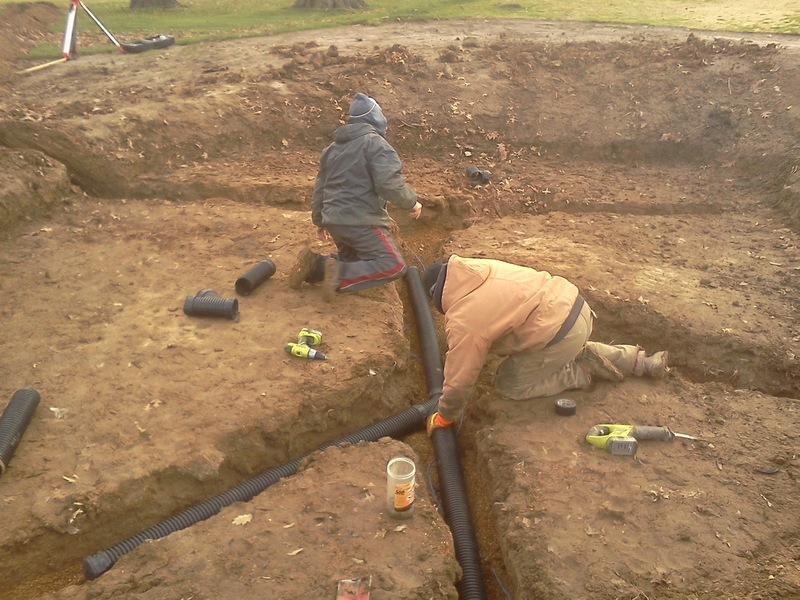 Staff adding a surface drain behind #5 as well as digging the dirt out of the trench so pipe can be laid. Staff back filling the outflow pipe of #5 which had settled from the weekend rain. 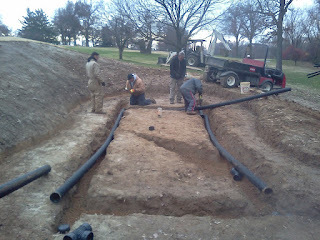 Staff back filling the pipe behind #5 green. 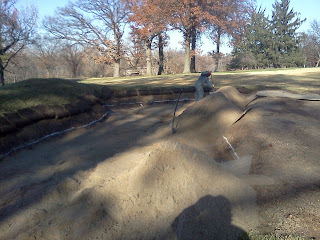 Front bunker of #17 getting drainage placed in it today. I know I'm a day late for this but wanted to thank our members, families and friends who have served or are currently serving in the military. 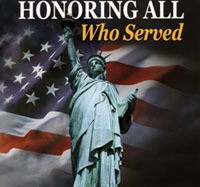 We appreciate the sacrifices you made for our country. Happy Birthday to the Marines which was Saturday as well! Day 34 Bunker Restoration Project, #4 Complete! 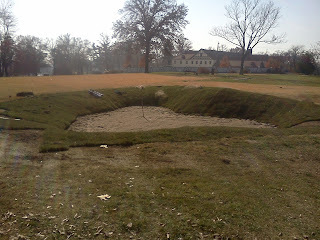 We were finally able to get #4 right side bunker completed on Friday. 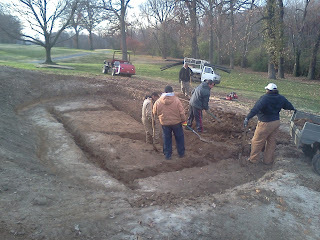 Its been a long time since we started #4, 27 days since we had finished the left bunker. Yes, change did finally come! The staff completed both left bunkers on #4 on Friday and we trenched the remaining four bunkers left on the course, 3 on #17 and the last one on #1. The staff cleaned out most of the soil from the bunkers on #17 in preparation for placing drainage in them early next week and the potential rain coming Sunday/Monday. I hope we can finish the bunkers on #17 this coming week and all we will have left is #1 and the practice for Thanksgiving week. 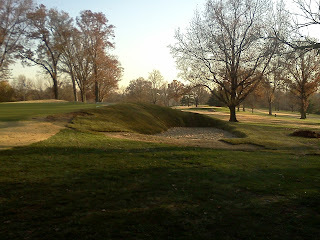 A longer view of the right side completed bunkers of #4. Trenching and soil cleaned up on #17 front left bunker. 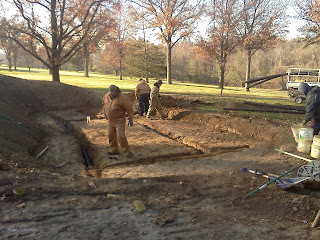 #17 left side rear bunker trenches. 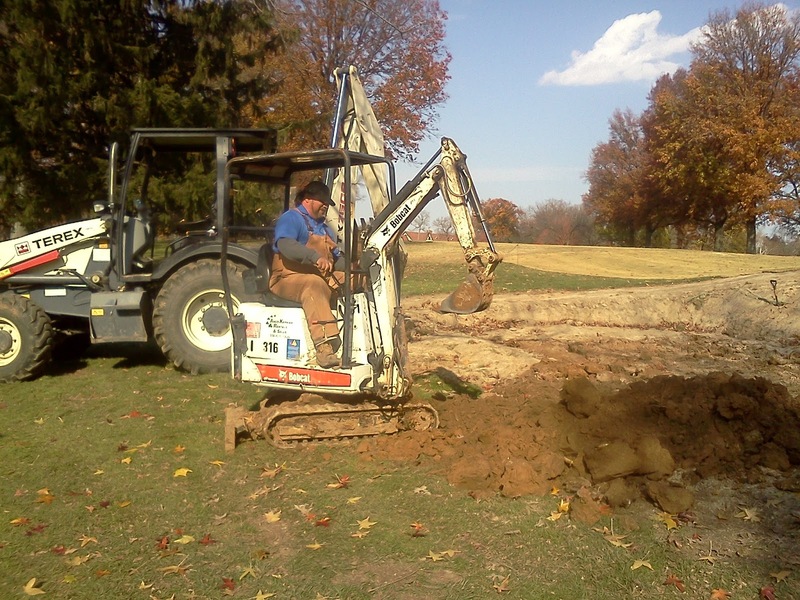 Skip removing soil from trenched #17. 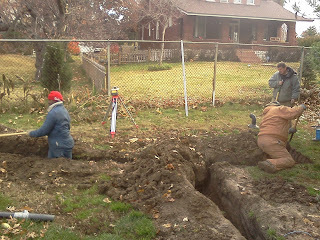 #17 right side trench line. 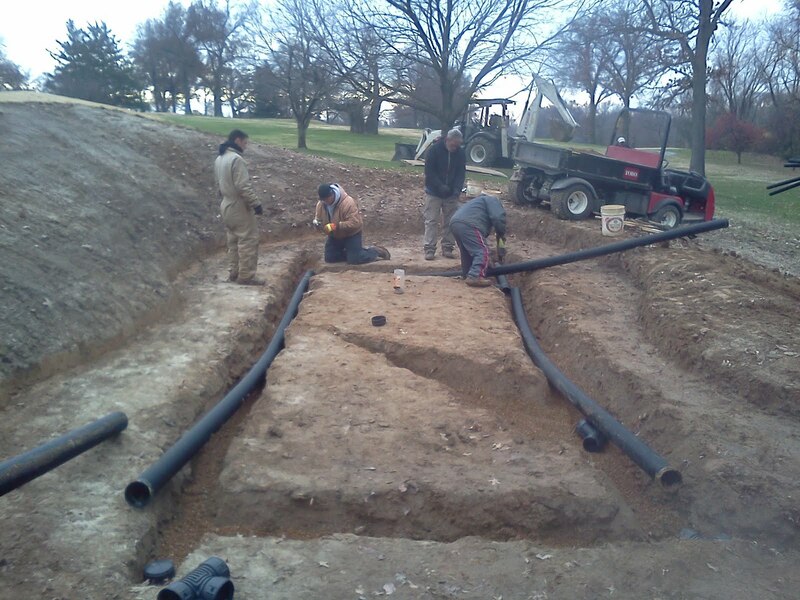 When Kye was shaping the right side bunker on #17, he came very close to the pipe and wiring that supplies the water for the green. 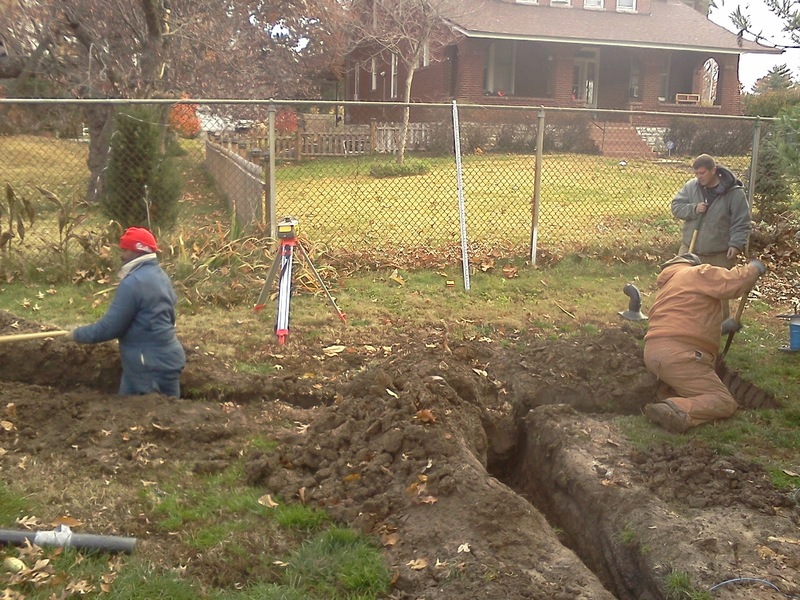 Skip hand dug a line and is burying the wiring back in place. Skip using the mini-excavator to trench a short line out the right bunker of #17. I used this machine over the last couple of days because of the wet conditions of #4. 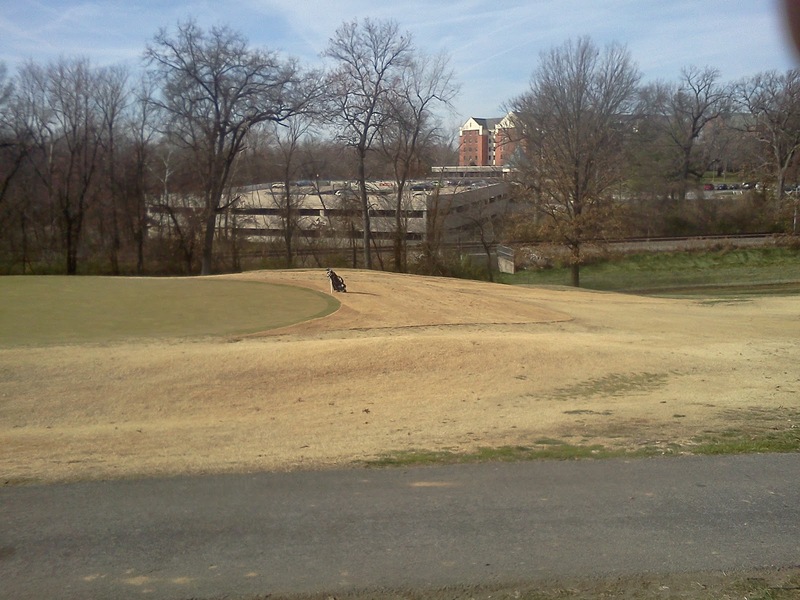 #1 bunker is similar to the bunker on the right of #17.